Stay alert! Watch out for your great enemy [accuser], the devil. He prowls around like a roaring lion, looking for someone to devour. Stand firm against him in your faith. Remember that your family of believers all over the world is going through the same kind of suffering you are. And the God of all grace, who called you to his eternal glory in Christ, after you have suffered a little while, will himself restore you and make you strong, firm and steadfast. To him be the power for ever and ever. Amen. Beloved, it is very easy to fall into the thought trap which says or sings: que sera sera “whatever will be, will be”. It is a thought trap because whosoever is caught in it is carried away by a limiting idea: the idea that the lot in life a man or woman is born into is fixed and set into law by powers beyond their reach—powers as high up as the heavens, powers as far flung as the furthest parts of the earth or powers as deep down as the depths of the seas. People who think this way look to created things: they search the sky above and the stars including the enormity of creatures which fly across the expanse of it; they seek answers from mother nature and the awe of its species on earth—including its wild beasts and creeping things; and they explore the great depth of the seas including its incredible fishes and mighty mammals which traverse its paths. They seek after the destiny these powers reveal, after all they say: all humanity originated and evolved from these things. But this is the thinking which faithlessness breeds. And that used to be the case for all mankind until Jesus came, for the bible says God has imprisoned all [who do not believe] in disobedience so that he might have mercy on them all (Romans 11:32 NLT). Again, the bible says: that we [without faith] are all prisoners of sin, so we receive God’s promise of freedom only by believing in Jesus Christ. Before the way of faith in Christ was available to us, we were placed under guard by the law. We were kept in protective custody, so to speak, until the way of faith was revealed (Galatians 3:22-23 NLT). Hallelujah! You see, the law because of the weakened state of mankind brought about condemnation and all forms of accusations which imprisons the mind, body and spirit; but Jesus Christ made faith available to us. It is through faith we live a life of freedom and peace with God. Say this with me: I am winning in life, winning in my relationships, winning in my finances through Christ Jesus. Nothing is impossible to me because I believe, I have faith in Christ Jesus. My destiny is in Christ Jesus: it is not in created things of this world. I am a new creation in Christ Jesus. I am born of God. Oh my goodness! Thanks be to the liberating power of Jesus Christ, Jesus came and died for our sins and then rose up from the dead, the bible says there is now available: an incredible great power for us who believe him, this is the same mighty power that raised Christ from the dead and seated him at the place of honour at God’s right hand in the heavenly realms. Now he is far above any ruler or authority or power or leader in anything else—not only in this world but also in the world to come. And God has put all things under the authority of Christ and has made him head over all things for the Church. And the Church is his body it is made full and complete with Christ, who fills all things everywhere with himself (Ephesians 1:19-23 NLT). God’s word makes it known to us that through Christ Jesus, his word, he created all things: the birds which fill the sky, the beasts of the field and yes the fishes of the sea. Through his the saving grace of his blood and the power of his name we have dominion over all the power of the enemy! (Luke 10:19, Psalm 8:4-8, John 1:3, Colossians 1:16). Say this with me: Christ has rescued me from condemnation and every accusation. I have a future and a hope. I am blessed. I am free from every curse which sin brings because I have faith in Christ Jesus. I believe Jesus Christ is the Son of God; I believe he died for my sins, was buried and rose again on the third day. Through Christ Jesus, I have righteousness and eternal life. I am free from all diseases: I am free from depression, free from anxiety, free from worry and all fear. Praise Jesus! 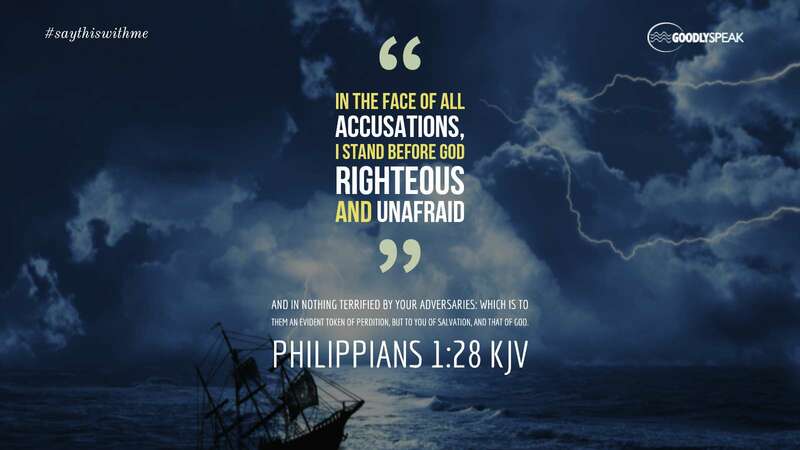 I am righteous and unafraid for Christ has cancelled all charges [accusations] against me, he took it away by nailing it to the cross (Colossians 2:14 NLT). I serve God freely and without fear through Christ Jesus. Amen.